Good Friday morning. (Was this email forwarded to you? Sign up here.) The March jobs report will be published this morning; here’s what to expect. Capitalism helped Ray Dalio build his investment empire. But in a lengthy LinkedIn post, the Bridgewater Associates founder says that it isn’t working anymore. Stay tuned: Mr. Dalio says that he’ll offer his solutions in another essay. Today’s DealBook Briefing was written by Andrew Ross Sorkin in New York, and Michael J. de la Merced and Jamie Condliffe in London. A federal judge gave Elon Musk and the S.E.C. two weeks to resolve a dispute about whether Mr. Musk violated a settlement he reached with the commission, Matthew Goldstein of the NYT reports. Mr. Musk’s tweeting is at the heart of the skirmish. The S.E.C. says that a tweet about Tesla production numbers violated the settlement, in which he promised to get approval from a Tesla lawyer before publishing any Twitter posts that include potentially market-sensitive information. His lawyers insist that the tweet didn’t contain material information. One of them said yesterday that the S.E.C.’s policy on what needs to be vetted was “murky.” Judge Alison Nathan of Federal District Court in Manhattan wondered if there was a “lack of clarity” and whether the settlement should be modified or struck down. “Take a deep breath,” Judge Nathan told both sides. She added that they should put on “their reasonableness pants” to find common ground. More: Tesla shares fell after it reported delivering fewer vehicles than expected in the first quarter. And the automaker’s electric vehicle competition appears to be catching up. 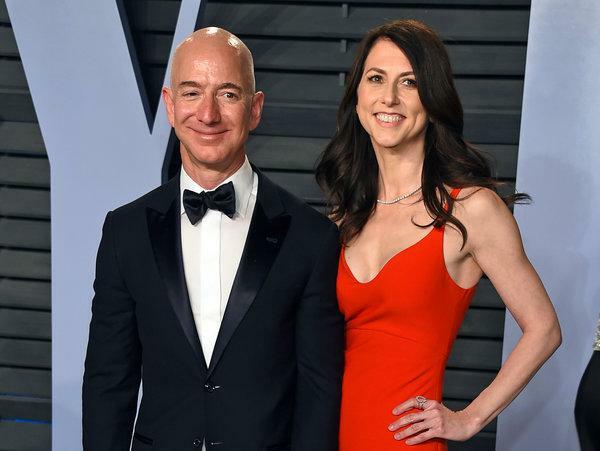 Jeff and MacKenzie Bezos said yesterday that they had finalized their divorce — and she will keep a big chunk of the Amazon empire. Mr. Bezos will keep 75 percent of the couple’s Amazon stock — which means he will hold about 12 percent of the company’s shares — as well as their family’s ownership interests in the WaPo and the Blue Origin space exploration company. That’s enough to keep his title as the world’s richest man. More important for him, he’ll keep voting control of Ms. Bezos’s shares. Even if she sells them, the recipient has to agree to hand over voting rights to Mr. Bezos. Ms. Bezos could have been entitled to half of the couple’s holdings under Washington State law, according to legal experts. It’s not clear what other compensation she is receiving from the split. Initial findings from an investigation into the Ethiopian Airlines crash last month suggest that Boeing didn’t give pilots enough guidance on new anti-stall software in the 737 Max 8. The Ethiopian Airlines pilots followed Boeing’s instructions when the anti-stall system kicked in, the report suggests. They then shut down the software and tried to retake control — but failed to do so. Four minutes later, the plane crashed. The system appeared to have forced the plane’s nose down several times in less than three minutes. It “left the pilot with no ability to gain control of the aircraft if it went to the full limit,” Dennis Tajer, a spokesman for American Airlines’s pilots union, told the NYT. Boeing has found a second software flaw in the 737 Max 8, separate from the anti-stall feature. The FT reports that this was the reason for a delay in rolling out software fixes for the plane. President Trump reportedly hoped to announce a final trade agreement between the U.S. and China yesterday. But he stopped short of that, Anna Swanson of the NYT reports, instead saying that it may take at least four more weeks to secure an “epic” trade deal. • “I think I can say some of the toughest things have been agreed to,” Mr. Trump added. Yet no matter what, Mr. Trump can already claim a trade victory. “Spurred by tariffs and trade tensions, global companies are beginning to shift their supply chains away from China, just as some Trump administration officials had wanted,” Keith Bradsher of the NYT writes. Herman Cain, the former C.E.O. of the Godfather’s Pizza chain and a presidential hopeful in 2012, may soon become President Trump’s next pick as a Fed governor. Mr. Cain is perhaps best remembered for his 2012 run for president, when he proposed an unorthodox “9-9-9” economic plan: a flat 9 percent tax rate, 9 percent business tax and 9 percent national sales tax. But Mr. Trump wants him on the Fed, calling him “a truly outstanding individual.” His nomination is dependent on the White House vetting process. Mr. Trump’s pick comes as the president has soured on the Fed. The president has told associates that selecting Jay Powell as the Fed’s chairman was a mistake, because of his insistence on raising interest rates. But the president’s Fed choices are drawing brickbats. Like Stephen Moore, the economics commentator whom Mr. Trump has already nominated for a place on the Fed board, Mr. Cain doesn’t have what critics say are the requisite qualifications. Critics worry that Mr. Trump is politicizing the Fed, which is meant to be apolitical. The possible nominations of Mr. Moore and Mr. Cain have “the potential to undermine the credibility of monetary policy,” Sarah Bloom Raskin, a Fed governor under President Barack Obama, told the NYT. JPMorgan Chase released its annual report to investors yesterday, and it included a long letter from Jamie Dimon about the bank’s role in shaping America. Capitalism is under pressure, but it’s better than socialism, he argues. “Socialism inevitably produces stagnation, corruption and often worse,” Mr. Dimon writes. But the JPMorgan chief also distinguishes social democrats, which some Democrats identify as, from true socialists. To respond, JPMorgan plans to strengthen its public policy teams “to take our advocacy and ideas to the next level,” he writes. More: Jamie Dimon reportedly spent much of last year considering a run for president — but decided there was no way a Wall Street C.E.O. could win. Where does Rudy Giuliani get his money? Rudy Giuliani, who was President Trump’s personal lawyer during the special counsel’s investigation into Russian interference in the U.S. election, is a very busy man, according to Stephanie Baker of Bloomberg Businessweek. • Mr. Giuliani runs “a globe-trotting consulting business,” Ms. Baker writes. “In the past two years he’s given speeches and done consulting and legal work in Armenia, Bahrain, Brazil, Colombia, Turkey, and Uruguay, among other countries,” as well as significant work in Ukraine. The World Bank’s board is reportedly expected to approve David Malpass as its president today. Lars Idermark resigned as Swedbank’s chairman amid an investigation into alleged money laundering at the Swedish lender. President Trump plans to nominate Jovita Carranza, the U.S. treasurer, as his pick to lead the Small Business Administration, potentially replacing Linda McMahon. The Senate confirmed Mark Calabria, Vice President Mike Pence’s chief economist, as Mr. Trump’s pick to oversee Fannie Mae and Freddie Mac.